At Big Wild, we want you to thoroughly enjoy your wilderness adventure! By carrying a backpack that is not overloaded, you will maximize enjoyment of your trek. After all, if you’re overloaded, the actual backpacking will be unpleasant; you won’t want to slow down and smell the roses — rather, you’ll be entirely focused on getting to camp and unhitching your load. This is not conducive to fully enjoying your adventure! By contrast, a comfortable backpack that’s not too heavy is a surprisingly pleasant way to enjoy a self-sufficient walk in the wilds. Our philosophy is that we want you to have the “necessities” that will make your trek comfortable, without being burdened by unnecessary extras. The listed prices for our trips include our basic gear package: If we are supplying your basic gear, you will get a comfortable backpack that we will specifically fit to your body, a waterproof pack-cover, a lightweight day-pack, a warm synthetic sleeping bag plus a ground pad, a top quality tent plus a lightweight cup/bowl/spoon. Although we use the best gear available, many of our regular customers choose to purchase their own equipment and thus they get our Big Wild gear discount for each trip they go on. For most folks, choosing the right gear — and clothing — means finding a balance between weight, comfort, function and cost. Usually, higher quality products cost more but weigh less. Within that context, the lighter the better! And with that in mind, read on…..
Bring a tent that’s the appropriate size for the number of people. For example, don’t bring a 2 or 3 person tent for one person. That’s extra weight! A groundsheet (“footprint”) is unnecessary unless you expect extremely wet conditions. Get a “mummy bag”, not a rectangular one. The mummy shape maximizes minimal weight/maximal warmth efficiency. Since sleeping bag ratings are notoriously optimistic, for most of our trips we recommend a bag that’s rated at least down to 15-20 degrees F. Synthetic bags insulate better than down if they get wet, but down is lighter and more compact for a given temperature rating. If you choose a down bag, make sure you keep it dry! Some backpacks are heavier than others, and you should certainly consider this when shopping for a pack. Nonetheless, we believe that choosing a quality well-fitted backpack that will carry your load comfortably is more important than saving a few ounces on this item. For a 5-7 day trek, we recommend at least 3,000 cubic inches (50 L) for an average-sized woman and at least 4,000 cubic inches (65 L) for an average sized man. Your day-pack should be lightweight. Big Wild co-owner Howie Wolke has designed a very lightweight day-pack specifically for being carried by backpackers. It is quite roomy and is produced by Boulder Creek Packs of Hamilton, Montana (406-363-5739) on a custom basis for our clients and guides. The “guide model” has side pockets, the “client model” is a one-compartment pack. There are other lightweight models available, too. A lightweight cup, bowl and spoon are all of the eating implements that you’ll need. Please also consider that for experienced hikers on our easier treks, shaving every unnecessary ounce is less critical than it would be for a tougher trip. Nonetheless, we strongly recommend that especially for beginning backpackers, err on the side of “leave it at home”. And remember, small things add up! Lots of small unnecessary items add up to an unnecessarily heavy load! And excessive loads make injuries more likely. On all treks, our guides carry the pots and pans plus a comprehensive first-aid kit, and we supply all other necessary items, including stoves and fuel, ropes, tarps, etc. Do not bring items that are not on the Big Wild Clothing/Personal Gear List. They will weigh you down! Bring exactly what is on the list and nothing more. The lightest weight camp/stream crossing shoes are “Crocs” or similar type footwear. Lightweight river shoes are a bit heavier, and most sneakers and running shoes are heavier yet. Crocs are perfectly fine for most people on most trips; however for trips with major river crossings, light-weight river shoes — which weigh just a bit more than Crocs — are a safer sturdier choice for most people. “Crazy Creek” type camp chairs are certainly nice to have, but consider the extra weight. A stuffed sleeping bag usually makes a fine backrest in camp. If you must bring a book, make it a lightweight paperback. Soap, shampoo, deodorant etc. are unnecessary, and in grizzly country we simply don’t allow them. Shaving paraphernalia is also unnecessary. It is especially important to minimize container size! Most stores now sell items such as tooth paste, sunscreen and hand sanitizer in airline-compatible small containers. Same thing goes for insect repellent. A small amount goes a long way and these small containers will last longer than a week on the trail! And please keep this stuff in a small Ziploc bag. Also think small when bringing items such as headlamps and medicine/supplements. Most pharmacies sell small plastic containers and we recommend a lightweight LED-type headlamp. If you’ve come with a friend or family, consider sharing items such as sunscreen, insect repellent and hand sanitizer. Every ounce counts! A Word About Food: We supply 3 meals/day plus snacks. There is no reason to bring any additional food items. However, if you must do so, please minimize and make sure that you’ve packaged any extra food you’ve brought in a Ziploc bag. This is especially important in bear country. Cameras and binoculars: Think light! Consider leaving that 2 pound telephoto lens at home. Also a number of companies make very good quality lightweight compact binoculars. And again, sharing with a hiking partner is never a bad idea! Clothing Tips: We want you to be warm, but efficient. Skimp on toiletries, not clothing! Some of our novice clients don’t know what we mean by “fleece” or “insulated jacket”, so the accompanying photos may help, though there are also other products that work. While we require that you bring everything on our Clothing/Equipment List, we want warmth to weight efficiency. A “warm jacket” means that it’s not just a shell, but has insulation. 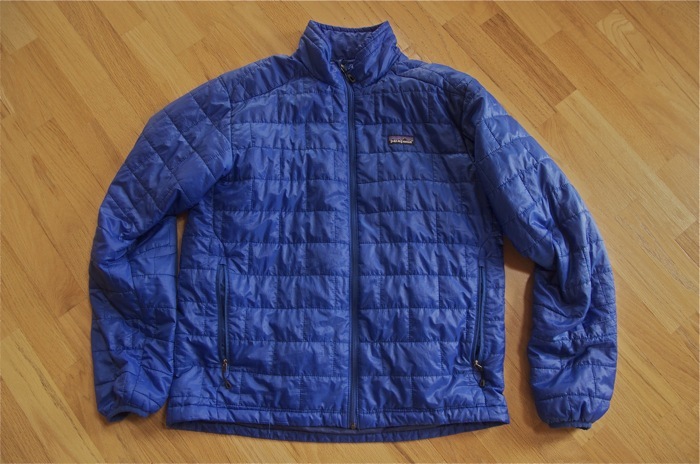 Examples: A fleece jacket (above left) or a lightweight synthetic fiber or down-filled nylon “puffy” jacket (below in blue) will keep you warm; the puffy being lightest. 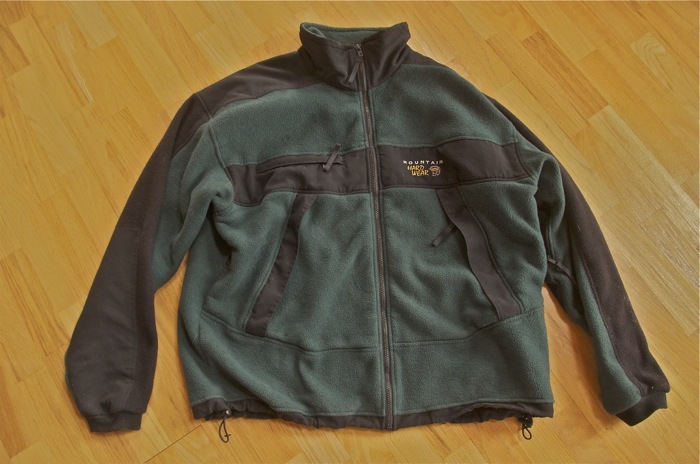 The jackets should be large enough to easily fit over the fleece pullover or wool shirt. Tight fits are for the city, not the wilderness. Fleece gloves and “ski hat” are light and compact. Don’t bring unnecessary duplicates. One spare T-shirt is all you need, although even that is a luxury that can be eliminated. One set of long pants is plenty, and you can reduce weight by getting the kind of hiking pants that unzip to become shorts. 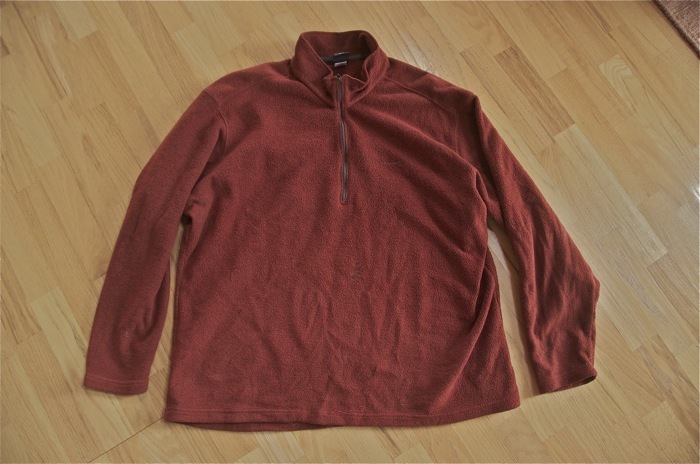 Wool shirts are nice, but a light-weight fleece pullover (below in brick red) as your mid-layer is even lighter and just as warm. And please, make sure that your two-piece rain-suit is lightweight and breathable, suitable for backpacking. It should be large enough to easily fit over all of your warm layers. Do not bring heavy rubberized rain-gear on a Big Wild trek. Save it for when you go fishing off the Alaska Coast! Note that hat, gloves and long underwear are not optional! Even in mid-summer in the Rocky Mountains, on most trips you’ll be glad you brought them. The three happy men in the bottom photo on this page were sure glad they had the proper clothing for this June trek in the Wyoming high country. Water: Water weighs over 2 pounds per liter, or about 8 pounds per gallon! It is necessary for sustaining life, and drinking plenty is very important for good health on a backpack trip. By contrast, carrying lots of it on your back is distinctly unhealthy. Why go to the trouble of shaving off a few ounces here and there to minimize pack weight and then load up with a gallon (8 pounds!) of water in a “Camelbak” water container? True, on some treks, mainly in the desert, there are stretches with little or no water when it’s important to carry an extra supply; thus your Big Wild guide will let you know when such a situation is likely. But on most of our trips, there is almost never a need to carry more than one liter of water. And again, your guide will tell you when that need will occur. So beware of the outdoor store clerk who tries to sell you a large capacity water container. As our Clothing/Personal Gear List indicates, a one liter water bottle (two of them for Southwestern trips) is all you need. And you may notice that Big Wild guides rarely carry a full bottle. Rather, oftentimes they simply drink heartily at rest/water stops and then carry a few swallows, which reduces their weight load by well-over a pound. Finally, if you plan to treat your water (recommended for trips in the southwestern U.S.), consider iodine rather than an expensive and heavy filter. Most iodine tablets come with “neutralizer tablets” (Vitamin C) which completely eliminate the iodine taste. And iodine can’t clog or otherwise malfunction!